OUR PURPOSE UTS graduates take initiative and innovate as socially-responsible global citizens. Students discuss The Death of General Wolfe, (oil on canvas), by Benjamin West 1776, retouched 1806, on display at the Royal Ontario Museum. With the permission of the Royal Ontario Museum. Thanks to you, last year... $1.4M in financial aid was awarded, with 1 in 5 UTS students receiving assistance. UTS established its first research institute, and we reached 84% of our $60M Building the Future campaign goal. $9,733,355 for the students of UTS. As of right now, 57 donors have planned a gift to UTS in their wills. We thank you for your legacy! *Unless otherwise noted, these figures are from the 2018 fiscal year, which runs from July 1, 2017 to June 30, 2018. A year of challenge and change As I reflect on our past year, the challenges that we have faced and the changes we are currently undertaking seem immense. Yet we are not only managing, we are flourishing. In preparation for a new school year at our temporary 30 Humbert Street location, new science labs were outfitted with the latest research-grade casework â&#x20AC;&#x201D; quite a step up from our current lab benches designed between 1910 to 1925. Students explored the new bustling neighbourhood of Queen and Ossington, discovering artistic, athletic, and culinary features, which will provide added stimulation and opportunity in our new environment. As we look forward to what life at UTS will be like for the next few years, we took the time to say a (temporary) goodbye to our historic home at 371 Bloor Street West. Over 600 alumni, students, staff, parents, and friends attended the Bon Voyage party and nostalgia reigned, as everyone had the opportunity for one final trip through the old hallways, classrooms, and stairwells. At the heart of it all are our students, who continue to give the best of themselves in all that they do. An exciting new era for UTS I first entered UTS as a student in 1944, and in my 74 years of association with this exceptional school, I can say there has never been a more exciting time than now. With the launch and ongoing success of the $60 million Building the Future campaign, we are moving closer to realizing our goal of providing a top-notch, technology-enabled learning facility for future generations of students. Our community has demonstrated remarkable generosity and enthusiasm for the campaign. Although I am inspired by their commitment, I am not surprised. For 108 years, UTS students have benefitted from an education that emphasizes not only academic excellence, but also shared values and leadership skills. In other words, our people rise to the challenge. 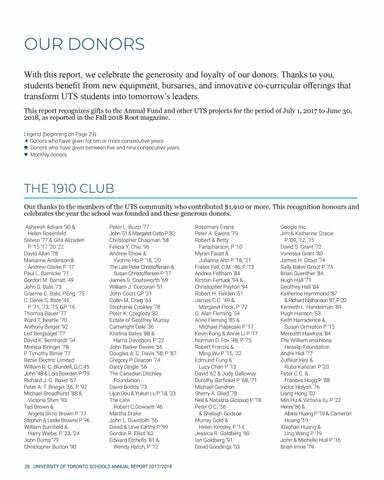 On behalf of the UTS Board, I thank everyone who has made a gift to the campaign. If you haven’t yet, I encourage you to help us build a revitalized UTS building at 371 Bloor St. West — and help our students meet the challenges of tomorrow. The future is now! The value of the UTS Foundation (UTSF) investments as of June 30, 2018 was $69,419,068 which nicely exceeds the 2017 yearâ&#x20AC;&#x2122;s value of $60,594,047. The reasons for this improvement are reasonable investment returns, continuing generous giving to the UTS Building the Future campaign, and the UTSF decision to sell equities and to transfer the proceeds to short-term securities in order to protect capital. These investment changes will still provide the UTSF with the funds necessary for bursaries, scholarships, and prizes. The UTSF investment portfolio as at June 30, 2018 was comprised of 71% shortterm securities ($49,323,821) and 29% equities ($19,722,181). The UTSF feels comfortable with this portfolio mix, keeping in mind cash inflows from the UTS Building the Future campaign pledges and available liquidity from equity sales if required. The foregoing indicates that UTSF investments exceed the $26 million Debenture Agreement entered into with UTS. The past year has been one of thoughtful and careful decision-making because of the approaching construction, challenging securities markets, and economic uncertainties. Accordingly, as I retire, I want to thank all the UTSF Board Members and the UTS Finance Office for their diligent contributions to our very special school over my years as UTSF Chair. Let the construction begin! campaign, the UTS community came together in a way that has never been seen before in our entire history. In just one year, donors gave $8.3M, bringing the total to $50.4M or 84% of our $60M Building the Future campaign goal. Thanks to you. UTS students are at the top of the podium. The first in the ranking. The forefront of their fields. And it’s all made possible thanks to you. 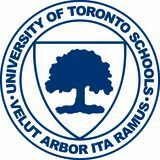 UTS took first and second place at the Independent Schools of Ontario Math Association Contest. The UTS student art installation for Nuit Blanche Toronto was picked as one of the city’s top 20. Pau won two gold medals at the OFSAA Track and Field Championship. UTS became the first school to win both the English and French Senior National Debate Championships in the same year. Reach for the Top won the National Championship. Girls Varsity Volleyball took silver at OFSAA. UTS won the Centre for Education in Mathematics and Computing Canadian Team Mathematics Contest, with an unprecedented five perfect scores. Science Teacher Jennifer Howell won the University of Chicago Outstanding Educator Award. Malhaar was selected to join Team Canada for the 2018 International Geography Olympiad. UTS students earned five gold medals, two silver medals, and placed as top scholar overall at the World Scholar’s Cup in Toronto and qualified for the global competition in Barcelona. UTS took the first four places at the ECOO Programming Contest. The first place was taken by an allgirls team, with a perfect score. Steven and David were selected to represent Canada at the International Physics Olympiad. XXIII For the 23rd consecutive year, UTS captured first place at the Ontario Classics Conference. UTS students earned two first-place and three second-place finishes at the Provincial French Public Speaking Contest. Anna won the bronze medal for Canada at the European Girls’ Math Olympiad in Florence. German Teacher Nicola Townend received the Ontario Modern Language Teachers’ Association’s Award for Excellence in Education. Rachel earned Top Delegate and Jerry received an Honourable Mention at the Rhysensteen Model UN in Copenhagen. UTS had the highest team score in the country at the Fermat Mathematics Contest. The Swim Team came away from the TDCAA Championship with one gold, six silver, and two bronze medals, and seven OFSAA-qualifying athletes. The UTS teams earned the top spot at the Varsity, Junior Varsity, and Middle School National History Bee and Bowl Championships. Aaron was selected as one of the top four Chemistry students in the country representing Canada at the International Chemistry Olympiad in Slovakia and Czech Republic. Both the UTS Varsity and UTS Junior Badminton Teams captured the TDCAA League Championship banner. Jessica and Gautam took first and second place in the Advanced Category of the Ontario High School German Contest. UTS students also took first, third, fourth, fifth, sixth, and seventh places in the Beginner Category. From expressing themselves on their first day of class to students in AP seminars disseminating their research through presentations and formal academic papers, clear communication is a key pillar throughout a UTS education. Collaboration Students learn to make important decisions together, contributing to each other's learning. One such example is Integrated Arts Day, where an entire grade produces original films in groups, drawing on each other's unique skill sets. Citizenship Students learn to think like global citizens and consider global issues through year-long projects on important topics like Truth and Reconciliation, sustainability, and climate change. students develop new ideas and products by identifying a gap in service in a community, and re-envisioning how to meet that need. Critical thinking Students evaluate information and arguments and learn to see patterns and connections to construct meaningful knowledge they can apply in the real world. Character With full-school support, students develop perseverence and resilience, be it by learning an instrument for the first time, or reflecting on their aptitudes and passions in Guidance Class. Empowerment Support Our Student Services team of three Guidance Counsellors, a Social Worker, and a Counsellor for Student Success take care of the whole child, from Grade 7 to 12, emotionally, academically, and socially. Mentoring The Branching Out alumni mentoring program celebrated a decade of matching senior students with alumni to give students guidance on their final year at UTS and transitioning to life after graduation. Programs and Practices Throughout the school experience, equity and inclusion are built into the ways in which staff and students are supported, support each other, learn, and teach. This year, these included leadership camps, curriculum supporting Truth and Reconciliation, and school-wide events celebrating LGBT+ equality and women in STEM. Merit-Based Admission UTS is proud of its merit-based admission process. Every year, alumni and volunteers take part in the interview part of the process, which emphasizes character assessment alongside test scores. 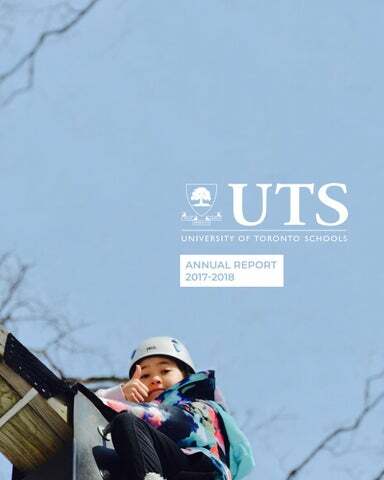 Innovation @ UTS March Break and Summer programs serve as an opportunity for students and families throughout the GTA to access the learning experience at UTS, which is made even more accessible through opportunities for financial aid. universityâ&#x20AC;&#x2122;s athletic and library facilities. new ways to lead in it. experience through practical training at UTS. Off to the next great chapter Be it around the corner or across the world, the UTS Class of 2018 is headed to the next exciting chapter in their lives. I know what Iâ&#x20AC;&#x2122;m doing next. Thanks to UTS. Thanks to our donors.